For the fourth consecutive week the Flying Dutchmen on Saturday, Sept. 22, will be playing an undefeated opponent. Hope hosts Illinois Wesleyan University at Holland Municipal Stadium. Kickoff will be 1 p.m. The game will broadcast on 92.7THEVAN and streamed on the internet. The nationally ranked Illinois Wesleyan Titans bring a 2-0 record to Holland while the Flying Dutchmen will be seeking to snap a two-game losing streak. The series started in 1992 with Illinois Wesleyan owning a 7-1 advantage, including a 35-0 victory a year ago. With an enrollment of 2,050 students, Illinois Wesleyan is a member of the College Conference of Illinois and Wisconsin (CCIW). The Titans this week are ranked 15th in the Division III poll of the American Football Coaches Association (AFCA). Hope is coming off a record-setting 63-47 loss to Concordia-Chicago. Illinois Wesleyan did not play last Saturday. Two weeks ago the Titans defeated MIAA member Alma 53-7. Quarterback Michael Atwell is the MIAA Offensive Player of the Week. 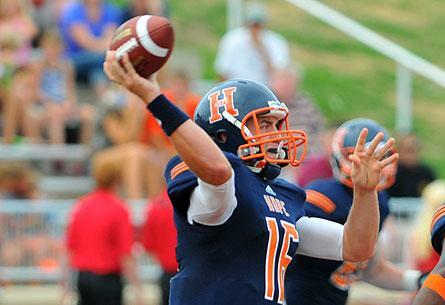 A junior from Geneseo, Ill. (Geneseo HS), Mike completed 27-of-53 passes for a career-high 445 yards and five touchdowns in Hope’s game against Concordia, Ill. last Saturday. He also had a rushing touchdown in the game. Junior tailback Shawn Jackson Comstock Park (Comstock Park HS) is closing in on a career milestone. Last Saturday he rushed for 159 yards to raise his career total to 1,637 yards. His career total ranks 11th on Hope's alltime rushing list. The tenth best career total is 1,715 yards by Bill Blacquiere from 1974-77. The alltime career leader is Brandon Graham who rushed for 4,362 yards from 1995-97. Over his career Shawn has rushed for over 100 yards in nine games, including twice this season. The Quarterback Club, a Hope College tradition for over 30 years, will hold its first luncheon of the football season on Monday, Sept. 24 in the auditorium of the Maas Center.